Broth, “Dashi” in Japanese , is often said that it is the basic essence of Japanese foods. I also think it is true because it is used for many Japanese foods and it brings very unique taste of Japanese foods. I think it is a kind of accumulation of Umami. However the time when Umami was scientifically accepted is very recent, Japanese people has been recognized it since ancient time. If the food is very delicious and the taste is different from spicy, sweet, sour or bitter, we usually say “Dashi ga kiiteiru (that means taste broth effectively)” or “Umami ga aru (that means that we feel Umami well)”. I know not only Japanese foods, but also other countries foods such as French, Chinese or so also use broth. I think the uniqueness of traditional Japanese broth is using seafood and not using any oil. 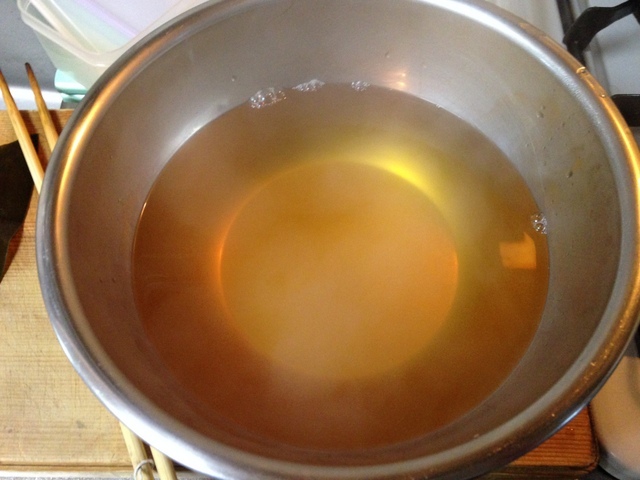 Today, I would like to introduce how to make very basic Japanese broth called “Awase Dashi”. 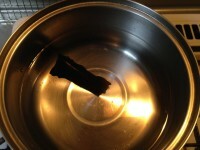 1) Place the Dried Kelt in the water for about 30min. Then boil it on strong heat. Pick up kelp before the water is boiled completely. 2) Add Katsuo Bushi (dried bonito flakes) in the pan and heat on strong heat. Once it is boiled, turn to middle heat and keep it for about 10 min. If there are some lye, remove it. 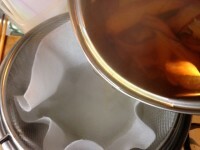 3) Place cooking paper in a strainer and pour the broth. “Awase Dashi” means mixed broth, Kombu Dashi and Katsuo Dashi. 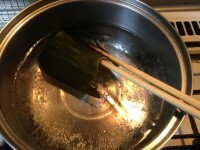 Perhaps, Awase Dashi is most used at home. Depends on menu, Kombu Dashi or Katsuo Dashi is used differently. 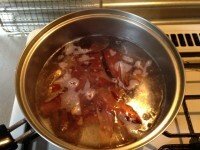 If you make the broth differently, you will use Dried Kelp or Dried Bonito with water and make it as same as above. Other than these ingredients, “Iriko” (Dried Anchovy) is used, and it is called as Iriko Dashi. Today, we can find many products of soup stock for these Dashi at supermarket. 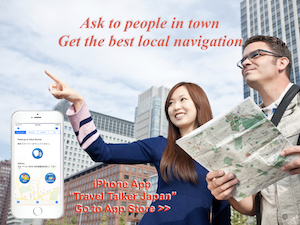 It’s very convenient and easy to use. 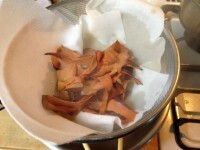 However I usually use such products, sometimes I want to make Dashi from scratch like above. It has better smell and taste. I mentioned “the uniqueness of traditional Japanese broth is using seafood and not using any oil” in earlier. But you may know other broth like Tonkotsu (Prok Born) or Torigara (Chicken Born) broth (or soup). Those broth often are used for Ramen. Of course, they are not from seafood. Because I think those broth’s history is only about 100 to 150 years, they are not traditional ones. These broth are used for many kind of Japanese foods such as soup (miso soup etc. ), simmered stuff (Nimono). 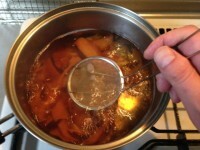 If you use Dashi effectively, you can make better Japanese foods. Simple, but tasty. Great site! 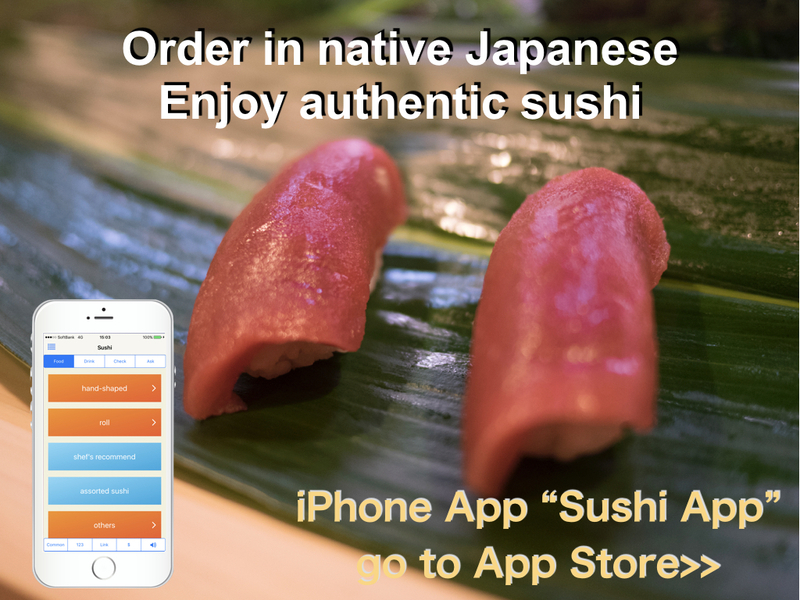 I lived in Japan for a few years and i was searching for japanese recipe´s further than sushi and sashimi. Congrats! Thank you for your comment, Leonard! Please enjoy this site and looking forward future posts.